Uhde's Star process technology is used by EPPC to convert propane into propylene. Uhde originally acquired the Star process technology from US company Phillips Petroleum during 1999. Since that time Uhde has developed the technology further. The Egyptian Propylene & Polypropylene Company (EPPC) propylene / polypropylene (PP) complex is located in Port Said in Egypt, about 170km northeast of Cairo. In January 2007, Egyptian Propylene & Polypropylene Company announced it was to build a propylene / polypropylene (PP) complex in Port Said, Egypt. The company invested $680m in the complex, which was expected to become operational during late 2009. The commissioning was, however, delayed and the complex began production in the second half of 2010. "The company invested $680m in the complex, which was expected to become operational during late 2009." The turnkey contract for building the complex was awarded to Germany’s Uhde at the end of 2006. Along with the propylene and PP plant, each with a capacity of 350,000tpa, the complex also includes utilities and offsites, as well as air fractionation and refrigeration units. The contract includes a technology licence, basic and detailed engineering, supply of equipment, construction, training of operating personnel and commissioning. Uhde provided its proprietary steam active reforming (Star) process technology which will be used for the commercial-scale production of propylene from the feedstock propane. "The turnkey contract for building the complex was awarded to Germany’s Uhde at the end of 2006." Uhde’s Star process is used for the dehydrogenation of light hydrocarbons such as propane to propylene or butane to butylenes. Uhde said this project will mark the first time that the Star technology will be used for the commercial-scale production of propylene from propane. 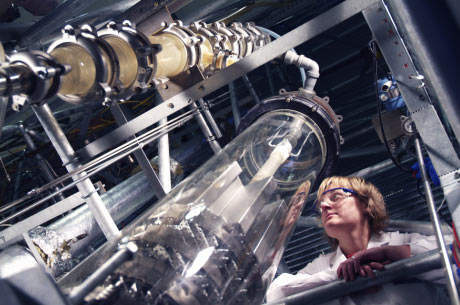 Uhde originally acquired the Star process technology from US company Phillips Petroleum in 1999. Since that time Uhde has developed the technology further. Germany’s Basell provided its Spheripol process technology for the 350,000tpa PP plant, which produces "a wide range of high-quality PP pellets". The process is said to be the "world’s most widely used technology" for the production of polypropylene. EPPC will supply the PP to both the domestic and export market. Propane feedstock is sourced from Egypt’s natural reserves. EPPC is a 50:50 joint venture between Egypt’s Oriental Petrochemicals Company and the state-owned Egyptian Petrochemicals Holding Company. The PP pellets will have a wide range of market applications, including textiles, rigid flexible packaging, consumer goods and automotive. Products from EPPC’s plant will meet domestic and export demands.